Creating a Council Encyclopedia is the best value for money activity that a Council can undertake. It is not always easy for Council employees (especially new ones) to find information about specific topics. Knowledge is lost when employees leave the organisation. You have hundreds of overlapping, plans, strategies, policies & frameworks. Different parts of the organisation use different terminology for the same thing, and the same terminology for different things. One part of the organisation is not aware of what another part is doing. Inconsistencies in policies, procedures & terminology are identified and can be fixed. Choose a platform & set it up. Seed the encyclopedia with general information. Identify & motivate your contributors. Make it central to your work practices. You can choose any platform you want, as long it is web-based! In the late 90's I got my first dial up internet connection. Bigpond encouraged its users to auto-create pretty lame personal web pages, but I decided to try and do something a bit more interesting. I downloaded the "Bare Bones Guide to HTML" and started building web pages using Notepad. I soon decided that a series of web pages would be a cool way of documenting information about Mildura Rural City Council's assets, and away I went. Whilst I wouldn't recommend that anyone try to build and encyclopedia using notepad, it does highlight the fact that expensive software isn't always necessary to get things done. The first page of the MRCC Asset Development Unit Intranet was created in 1999. By 2006, the site consisted of almost 5,000 pages of information. Despite the fact that the Comic Sans font is used extensively, the pages look pretty good, considering they were all written using Notepad. 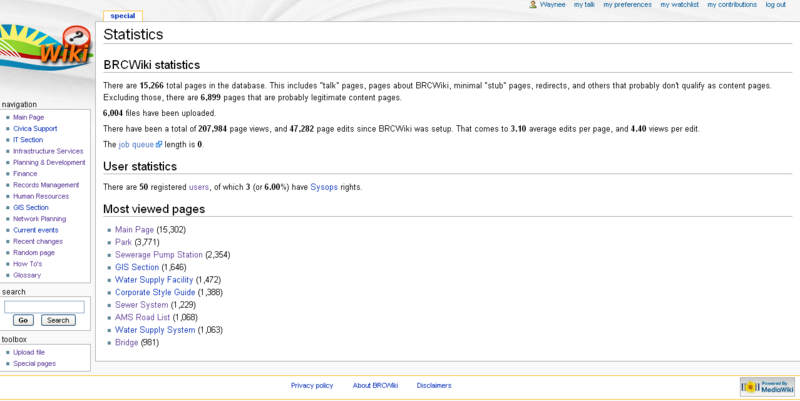 MediaWiki is the software behind Wikipedia. It is without doubt the most used wiki software in the world. It is a very high quality free & open source platform, with a large user community and many third party extensions are available that let you get even more out of it. 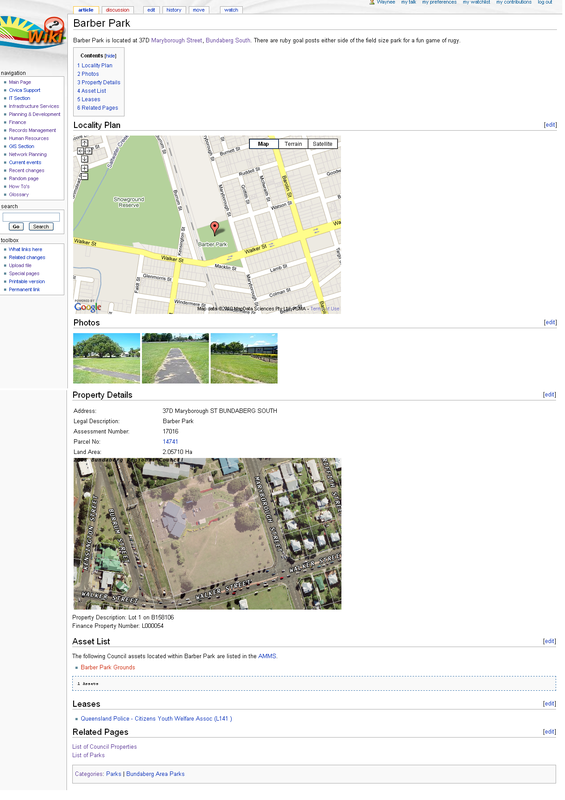 Not long after I moved to Bundaberg in 2006, I noticed one of the IT guys making notes about a job he was doing for the Assets Unit in what turned out to be a MediaWiki wiki that he had set up. It occurred to me that it would be a very good tool for setting up an Asset Information system similar to the one I had set up in Mildura. The rest is history. MediaWiki proved to be a fantastic tool for the job. has impressed most people from outside of the organisation who have seen it. 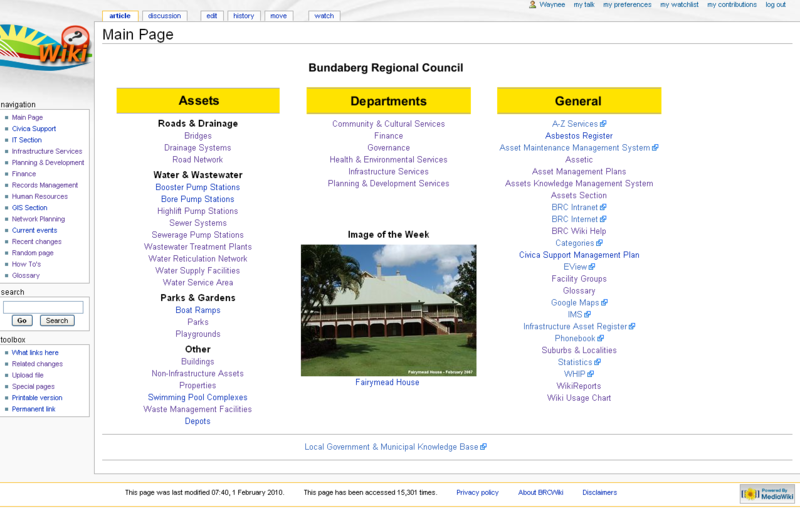 On 13 October 2008 I created the first page of the Local Government and Municipal Knowledge Base. The site is designed to encourage Councils to openly share knowledge & ideas and to help them set up their own internal knowledge bases. When I moved to Whittlesea City Council in late 2011, I started again, this time using Sharepoint. Fortunately I wasn't starting totally from scratch again this time. Because I had published a lot of generic knowledge to the LGAM Knowledge Base, I was able to use some of this information to quickly build up a framework for Whittlesea site and hit the ground running. As I learn new things and come across new ideas in my new role, I try and incorporate this knowledge back into the LGAM Knowledge Base, which I believe my former co-workers in Bundaberg still refer to. I hope and believe this process resuIts in benefits to both my current & previous employers. Setting up a wiki encyclopedia is very cheap. MediaWiki is free, and takes about an hour for an IT person to set up. You will need a bit of space on a server. Wikidot will host 30 private sites for $240/year, and in the past they have had regular half price sales. LGAM will host it for you through Wikidot for free. I have used the term wiki in this presentation a few times already, but perhaps I should explain it. I've had a lot of success with wikis, and I think they are a fantastic tool, but the feedback I've received from some other Councils is that often they are flops. I have thought about this a fair bit, and I think I have some of the answers to making them work. Find at least one really motivated person who wants the project to succeed. Change your work practices to make the encyclopedia central to what you do. On the front page of the LGAM Knowledge Base I state that "It was created for the use of and to promote collaboration between Local Councils, Water Authorities and associated organisations, and to help them to save money by sharing ideas & information." That's all true, but it serves one more important purpose. It contains lots of information you can use to seed your encyclopedia, and get it to critical mass with the least possible effort. The information is all published under a creative commons sharealike licence. Take what you want. Use it how you want. Improve on it. Obviously someone who has been at the organisation a long time and has lots of local knowledge would be the ideal person to help build the encyclopedia, but that person isn't always the person who is going to get the most benefit out building it. It could be worthwhile taking the opposite approach and looking for people who have an interest in the encyclopedia project succeeding. Once the encyclopedia is up and running and is starting to fill with useful content the person whose head is full of knowledge about the organisation might well be easier to convince of the value of the project. I did a bit of research on what motivates people to collaborate. It turns out there are 4 key motivators. Make of that list what you will. Perhaps you can go the money option and employ someone to build the encyclopedia, but that isn't the only way to make things happen. And just in case you are wondering about my motivation….. I get very frustrated every time I think about the amount of money Australian Councils pay every year for crappy software & consultant reports. (I know there is good software and there are good consultants out there, but there is a lot of rubbish too). I contrast that with a combination of free software and a simple idea that I think can save councils millions of dollars, and I passionately want to do something about it. This sounds like a big ask, but it is actually pretty easy. Here is how I do it. When I'm sent an e-mail, or read a report, or I hear someone talking, and I see or hear a new or strange term or acronym being used. I try to see if that term is documented and easily findable in the corporate council system. If it's not, I do a quick google search, or I ask a few people about it or I post a question to a forum to find out more about it. When I find something out I document the term in the encyclopedia/wiki. That's it. Simple, but powerful. I learn more about a Council activity, asset or project, then I document it to help others understand it better too. As a huge bonus, the act of documenting something helps you understand the subject you are documenting better. This is why I believe creating a Council Encyclopedia is the best value for money activity that a Council can undertake. Every minute spent creating the encyclopedia makes the creator more useful to the organisation. It is like reducing the cost of staff training to zero, and creating a very useful customer service & knowledge management tool in the process. I want every Council and Water Board in Australia to create an Encyclopedia. I want them to do it by 2020. I want local governments and utilities around the world to follow our lead. I want every Council and Water Board in Australia to share the knowledge they have captured in their encyclopedias with every other Council and Water Board via one or (preferably) more public knowledge bases/encyclopedias. Not many Councils (maybe 1%) are doing this at the moment. My goal is to roughly double this number each year until everyone has one in about 2020. A former colleague of mine often likened peoples effect on local government to stirring a cup of tea. He said you can stir all you like, but as soon as you stop stirring the motion in the tea cup settles down, and you are back where you started. I like the fire analogy better. I feel like I have managed to start a small flame, and I want to turn that flame into a raging fire that sets local government alight and changes it forever. You out there in the audience are my fuel, and I hope I have set one or two of you on fire with the will to implement the single best value for money activity that a Council can undertake.